Going away? Boarding your pet? Here are some things to consider about WHERE to board your pet. If the word "boarding" conjures up visions of growling matrons and gruel, rest assured that the right pet boarding facility is far from the fearful Victorian boarding house you may (only once) have threatened your kids with. It ain't no hardship for pets (particularly dogs) to be with other animals, in the right environment. Most, once they're used to it, take to it like a fish to water. :-) So, following hot on the heels of The Right Pet-Sit-Fit from last week, we bring you To Board or Not to Board (with apologies to Shakespeare). Go on the recommendations of friends, family and your vet in Dubai (or elsewhere!) if possible. Delighted customers (and pets) are the best reference a kennel can get. Find out what type of pets they board. Kind of obvious, but if you have an exotic bird, for example, check that they're Polly-friendly before you visit. Be ahead of the pack (i.e. timeous) and begin making enquiries a few months before you are scheduled to go away. A popular boarding spot will probably be quite busy and booked-up in advance. This goes double for holiday times and Christmas. So get your ducks in a row. Make an appointment to visit the facility. Part of being a pet owner involves sleuthing, always being "on the scent" with what's going on with your furry beloveds. When visiting a potential boarding facility, it's time to have all your investigative senses at the ready! No Visitors Allowed: Although there might be some occasional good reasons for a "closed door" policy, our general view is that if anyone isn't welcome at any time (just about) to pop in and look around, with the helpful guidance of one of the staff to really explain things and answer questions, then the facility probably ought to be avoided. Transparency and openness, both with regard to the facility itself and in the general handling of all its "secrets" makes any business suspect. On the Scent (for real): Put your nose to the air and take a deep sniff (and in some cases, not so deep)! Hopefully breathing in the scent of the place will knock you out for lovely reasons and not for reasons related to animal toileting and, potentially disease. Both indoor or outdoor facilities, if holding to proper cleaning and hygiene protocols, should always smell, well, like perfectly normal places and not overwhelmingly of urine and other things, except, perhaps, first thing in the morning after the animals have had all night to "mess" around. Further, the cleanliness should translate into a generally neat environment where you feel that the handlers are on-site and in control, and that management of the facility care as much as about the look and feel of the place as they are supposed to about the animals in their care. If this part of isn't right, consider what it likely means about their attention to detail in all other matters. Say WHAT? 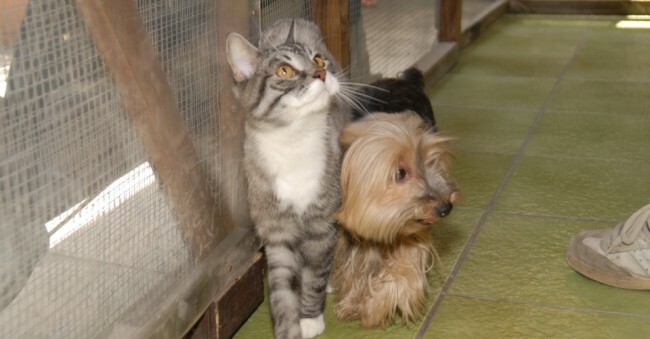 : A thriving animal care facility, and in particular a kennels, is unlikely to be a quiet place. This is not a bad thing. Think of a playground of happy exuberant animals making lots of noise. Older dogs and cats can be more sensitive to a noisy boarding environment, so check if there are any difficult/older boarders with health or temperament issues also being looked after, and how well they seem to be doing; if there are, then the place just might be the right one for you. Layout: This is mostly relevant to dogs but can pertain to cats and other animals too. Some kennels have enclosures facing each and configured in a generally open environment where the animals see, smell and hear each other all day long. Others are designed to maintain greater levels of isolation and privacy so that the only time your dog is socialising is when they are out of their enclosures and into some common area for parts of the day. If your animal is very sensitive to "in your face" interaction with other animals, then the latter is possibly the better option for you and you should look around to find just such a facility. While the overall layout is not necessarily a "deal-breaker", how the layout looks and feels to you, and how it "speaks" to what you perceive is your pet's needs, is important. This said, there are some aspects to the layout which are not well understood by most pet owners and sometimes not to facility operators either. While it is certainly true that some animals really do need to have a greater degree of privacy or isolation due to their particularly anxious and sensitive temperaments, it is more often the case that even these animals will greatly benefit from a more community-inclined environment (both in terms of the design of the facility and with regard to the actual handling and management of the animals) with lots of interaction and exposure to all the animals around them. The feeling of a pet owner that their particular dog is not so inclined is usually more down to their owner perceptions and worries, and then ultimately their handling of their own pet and what that pet is now used to, than it is down to what the dog actually needs and will enjoy. So we would argue that there are very few dogs who will not thrive in an environment with lots of indirect, and direct, exposure to and interaction with other dogs all day long, whether or not they are actually out in the common areas, and that even the very timid will come out of the experience much less timid and much more able to be able around other animals and people, all in a way that will make both the pet and the pet's owner really very happy. And "layout" or infrastructure and design have a lot to do with contributing to either way of looking at things. The Inside Story: The inside of your pet's enclosure obviously needs a decent amount of space, and in the case of cats, more than enough to provide for a distance between the living area and the litter box and food. What's a "decent" amount of space? Good question! Numbers won't really help here, so we won't bother with dimensions, but in the worst cases we've seen enclosures at facilities which really are barely big enough for the dog or cat or any other animal to really move around, enjoy the space and get comfortable. So look around at different facilities and see what your options are. Health and Safety: There's hardly anything more annoying than having your boarding facility force you to ensure that your pets vaccinations are all up-to-date for their boarding stay. We get it. Annoying. But consider this: what would happen to all the animals at the facility, including yours, if there were no strict adherence to this requirement? So, instead of looking for a facility that takes it easy on this front, a BIG RED FLAG should go up for you if they are not very very strict indeed. How your chosen boarding facility handles this says a lot about the care and attention to detail and overall attitude to animal husbandry they have. Not to be taken lightly at all. Vet Care: Contrary to often-held beliefs, a great boarding facility does not have to have its own on-site vet in order for it to be great. It is extremely extremely extremely rare that an emergency is so urgent such that a vet on-site will make any difference at all to the care your pet will receive. And if it's a top-notch business, the handlers will be well-trained in emergency care procedures so that your pet will be safe until brought to a vet somewhere in town. Which brings us to the next point: Although not having a vet on-site is not a problem, all boarding facilities must have a good relationship with a nearby veterinary clinic, and you should definitely check into that to make sure it is so. Still further, however, and as alluded to a moment ago, look into how much the handlers at the facility know about medical care. We're not suggesting that they should be doctors and nurses, but if the facility is being run at the highest level, there will be a certain amount of training and knowledge not only to deal with emergencies, but in fact more importantly (because it's more frequent) to deal with the common, everyday issues that do arise, especially with regard to the ability to identify problems which are not obvious and require a trained, skilled and experienced eye to identify. Happy Handlers: If the staff are efficient, happy and bonding with the animals, your mission to find a (more than) suitable boarding spot for Spot is definitely taking a positive turn. You'll be able to tell from their body language and your animal's instinctive response to handler there whether or not that handler has a natural and easy relationship with animals and your pet, and how in-tune that handler is with animals generally. And this is obviously very important ~ an animal care organisation ought to have animal people working in it, right? But importantly, this natural affinity for animals is not enough. As we say, "Love... and other stuff too" because, in fact, love for animals is not really enough ~ much of this blog article is just about that, in fact; the need to have a lot of knowledge and the right spaces for your pets as well. Exercise, Play and Grooming: How much exercise, playtime and grooming will your pets get? Yes, all your pets, not just dogs; cats, birds, rabbits, small rodents and exotics all need this kind of attention in one degree or another. Does the boarding facility have a good staff:animal ratio, making it possible for them to devote the time needed to providing a real watch over your pet and quality playtime (every play with a big African Grey? Very cool!) Basic care is always demanding enough, as you know, but it's the exercise and play and grooming that really takes that care to the next vital level. Can't have Felix not looking and feeling in tip-top condition when you return from your trip. In fact, oftentimes a good boarding business will return your pet to you in better condition than it arrived! Final Countdown: If you've chosen the place and have made a booking, or are very seriously considering making one, but you nevertheless feel uncertain and wary, why not do a trial run? Book just a couple of days for your pet long before you actually go away for the real trip so that you're in town and can really get a feeling of the place and whether or not you trust it and its people. You can even go in to visit your pet while he's there, just to be doubly sure. Seriously, consider it. It will teach you a LOT about the place and its people and will help a great deal in putting your mind at ease. This also gives the handlers an opportunity to get to know (and love :-)) your pet, understand any special needs he might have and to give you feedback and reassurance with regard to your longer stay in the future. The great thing about finding a professional, loving and ultimately well-designed and knowledgeable facility full of real animal people, besides the awesome holiday your dearest four-legger will have, is that you have the opportunity to relax and trust someone other than yourself with the care of your pet. So put in the time and effort if you can... to see if they can..